The Gannon University baseball team traveled to the Russ-Matt invitational in Winter Haven, Fla., over spring break, and the Knights finished 7-3 on the week to push their season record to 9-5. On Feb. 25, Gannon swept the opening-day doubleheader, beating Wheeling Jesuit, 15-2 and 3-2. The next day, the Knights defeated Kentucky Wesleyan College, 5-4. On Feb. 28, Gannon edged Tiffin University (Ohio), 8-6. Two days later, the Knights split a doubleheader against Tiffin, losing 7-3 and prevailing 5-3. On Friday and Saturday, Gannon finished its trip with two doubleheaders against Northwood University (Michigan) and West Virginia Wesleyan College, respectively. The Knights fell in the first doubleheader, 12-11 and 5-2, and then turned it around with 7-3 and 15-1 victories against West Virginia Wesleyan. On Feb. 25 , the Knights were propelled by a Mike Colosi walk-off double in game 2, and a pair of complete games from Santiago Mendez and David Cricks to sweep Wheeling Jesuit for the third consecutive year at the Russ-Matt invitational. In the opener, eight runs combined in the fifth and sixth innings put the game out of reach. Joey Colosi recorded an RBI single while Gregory Nicolia finished the scoring with a two-out, two-run base hit to increase Gannon’s lead to 6-1 in the fifth. The Knights then added five more runs on five hits in the sixth to put the score at 11-1. Colosi once again started the scoring with an RBI double. Austin O’Shei and Charles Benack added two runs by way of base hits. Gannon completed its scoring with another four runs during the top of the seventh and posted a scoreless bottom of the seventh to cement the scoring at 15-2. All nine Gannon starters recorded a hit, including eight with multiple hits. Nate Cardy, Kyle Cox and Nicolia finished the game with three hits each. Mendez tossed a one-hit complete game, striking out four and walking three. Only one of his two runs allowed was earned. In the nightcap, Wheeling Jesuit took its first lead of the afternoon in the sixth inning, but Gannon answered big-time in the bottom of the seventh. Benack led off with a double and scored the tying run one out later on a Cardy double. Cox was intentionally walked and Mike Colosi took advantage of his spotlight, producing a walk-off double to win 3-2. Cricks improved to 2-0 with a five-hit, complete-game performance. He allowed two runs, striking out four and walking none while becoming the seventh Knight since 2000 to win nine games during his career. The next day, Gannon snapped a 2-2 tie with a three-run sixth inning to hold off Kentucky Wesleyan in a regularly-scheduled nine-inning game. The Panthers tied the game at 2-2 in the top of the fifth inning before Gannon took the lead with a crucial three-run sixth inning, scoring all three runs with two outs. Cody Callaway and Nick Restuccia reached with singles and Anthony Grimone drove in one with a double. Benack followed with a two-run single for a 5-2 advantage. Kentucky Wesleyan narrowed the deficit to one with a pair of runs during the top of the eighth. In the top of the ninth inning, the Panthers put a runner at third with one out, but Nico DiPaolo slammed the door shut with a ground out and strikeout to end the game. Restuccia highlighted the offense with a 3-for-4 game, scoring one run and adding an RBI. Aaron Jackson started on the mound and received a no-decision after allowing two-runs in 5 1/3 innings. Gannon then split games against Tiffin on Tuesday and Thursday. On Tuesday, Gannon rallied from an early 4-0 deficit with seven consecutive runs in the middle innings and remained perfect during its Florida trip. The Knights tied the game at 4-4 with a three-run fifth inning. The team loaded the bases with one out on singles by Andrew Wagner and Benack followed by a walk to Nicolia. The first run crossed by way of a wild pitch, before an RBI ground out cut the deficit to 4-3. Cox tied the game with a two-out RBI single. In his next at-bat, Elijah Quiceno pounded his first career home run to left field. The next two runs crossed later in the inning on a Nicolia RBI single and a suicide squeeze bunt by Matt Oruch. Tiffin added a run in the bottom of the sixth, but Gannon countered with a run of its own in the top of the eighth. DiPaolo once again recorded a save after a solo shot in the top of the ninth narrowed the gap. Benack was on top of the box score, producing three hits in four at-bats while scoring three runs. Jarod Morrison made his first career start on the mound, pickup his first victory in the process. He allowed five runs, three earned, while striking out five. The next game against Tiffin yielded a different result, as the Knights lost the first game of the week, 7-3, in a doubleheader. Ryan Vargo struck out a career-high eight hitters while tossing a complete game during a 5-3 victory in the nightcap. In game one, Jared Beach recorded his first two career hits and scored once. Cory Hegedus tossed two scoreless innings of relief work during his collegiate debut. In game two, The Knights took the lead for good in the top of the fifth inning after four consecutive hitters reached base. RBI singles by Quiceno and O’Shei pushed the runs across. Quiceno topped the Gannon hitters with two hits and three RBIs in three at-bats. Beach produced another good game, scoring two of the team’s five runs. In Friday’s doubleheader against Northwood, Gannon dropped a pair of games, 12-11 and 5-2. Cardy blasted two home runs during the first game and Cox extended his hit streak to 16 games. In game 2, Cox topped all hitters with a 3-for-4 showing and one RBI. In the team’s final two-games of the Russ-Matt Invitational, Gannon cruised its way to two wins, finishing the road trip strong against West Virginia Wesleyan. The team pounded out 23 hits while scoring 22 runs during its sweep. Gannon scored three runs during its first at-bat by way of loading the bases early, a walk to produce the first run, an infield single and a throwing error, before increasing its lead to 6-0 in the top of the fourth. West Virginia Wesleyan was able to make it interesting with three unearned runs in the bottom of the sixth, but was unable to get closer. Jackson went the distance on the mound, allowing no earned runs on five hits while striking out five. In the nightcap, Gannon countered West Virginia Wesleyan’s first run with five of its own in the bottom half of the opening frame and didn’t look back. Quiceno started the scoring with an RBI double before Beach followed with a two-run double. O’Shei capped the scoring with another two-run double for the 5-1 lead. The Knights stretched their lead to 10-1 with two more runs in the bottom of the third inning. 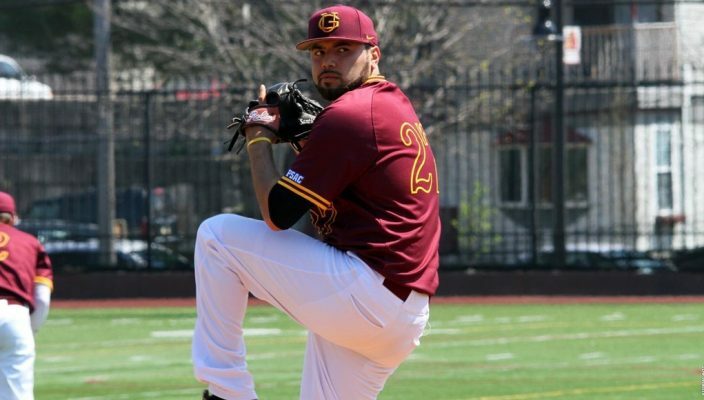 Gannon tacked on an insurance run in the sixth inning when Grimone’s sacrifice fly drove home Wagner with the game’s final run. Beach and O’Shei led the scoring attack with four and three RBIs, respectively. Morrison improved to 2-0 with five innings of work, allowing one run on five hits. He struck out four and walked one. Gannon finished the week ranked seventh in the latest National Collegiate Baseball Writers Association (NCBWA) Atlantic Regional Poll. Cox was given the second game off and left Florida with a 17-game hit streak dating back to last season; Benack extended his hit streak to 13 games as well. Up next, Gannon will travel to Davis & Elkins Saturday and Sunday, March 18-19, for a four-game regional series. The first game of the March 18 doubleheader is set for 1 p.m. in Elkins, W. Va. So far on the season, Cox is leading the way offensively with a .420 batting average and a team-high 10 RBIs. Nicolia checks in at .419 while Benack is hitting .378 with 15 runs scored. Cardy also has scored 15 runs to go with his .351 average while Wagner is hitting .364 with 10 runs scored. On the mound, Jackson has a pair of wins and a team-leading 2.79 ERA in three starts.